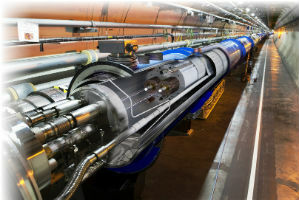 The European Organization for Nuclear Research (CERN) operates the world's largest particle physics laboratory in the world. Thousands of scientists and engineers from over a hundred countries converge there to perform high energy physics research. Over the past few years BYU researchers have performed a number of experiments there in Geneva, Switzerland using the particle accelerators to test FPGA reliability subject to radiation. While configurable systems have been shown to be very effective for high-throughput sensor processing, they are relatively unsuitable for operation in the hostile space environment. Like dense memory arrays, FPGAs are susceptible to temporary upsets in the state of its internal memory cells. Such upsets destroy not only the internal data used by the FPGA, but configuration information used to determine the circuitry performed by the FPGA. In order for FPGAs to be used reliably in a space environment, methods must be identified to detect and correct transient memory upsets. Further, design methods must be created to improve the reliability and robustness of FPGA designs operating under these conditions. This effort will investigate methods for improving the reliability of FPGA designs operating in a space environment by creating a testbed for automatically testing the reliability of FPGA designs, investigating specific FPGA bitstream issues related to reliability and identifying design techniques to improve the reliability of FPGA designs.